RAYSTAR OLED REX128128B is a Circular passive matrix OLED display which is made up of 128x128 dots, diameter 1.18 inch. The REX128128B has the module dimension of 36.98x 41.23 x 2.05 mm and Active Area size 30.00x30.00 mm; it includes SSD1327ZB controller IC and it communicates via 6800/8080 8-bit parallel, I2C and 4-wire SPI serial interface, 3V power supply. The REX128128B is a COG structure OLED display which is ultra-thin and self-emitting; it's lightweight and low power consumption. 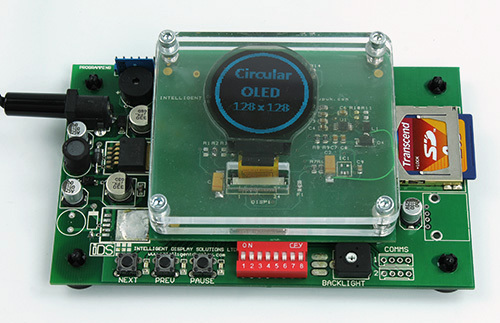 This Circular OLED module is suitable for portable instruments, wearable devices, home applications, etc. The standard emitting colours for this item are White, Yellow and Sky Blue. REX128128B has an operating temperature of -40°C to +80°C; with a storage temperature of -40°C to +80°C.